It is no coincidence that the famous Christmas carol, The Twelve Days of Christmas, features the line "Seven Swans a-swimming". In some circles, the number 7 is regarded as the number of perfection (in others, it is 3) and what better companion to the number of perfection than the image of the perfect creature, the Swan. The Swan is more than just a beautiful bird; it is the quintessential being of balance and harmony. It is also a symbol of Transformation through Enlightenment. In the classic fairy tale, The Ugly Duckling, the duckling becomes transformed into a being of perfection - a swan - after it has learned to embrace its true nature. The ugly duckling "mentally transforms" into what he was destined to be. The Celtic tradition abounds with stories of kings and fair maidens being transformed into swans, either as a reward for their long suffering or as a curse from evil, greedy enemies. The Irish folklore stories of the Children of Lir and the Wooing of Etain are great examples of this concept. The Nyungar Aboriginals of Western Australia believe that they were once black swans that transformed into men. Swans are also associated with eloquence, intelligence, and the gift of poetry. Countless classical playwright, scholars, and philosophers were nicknamed, the Swan. Shakespeare was the Swan of Avon, The Greek writer, Homer, was the Swan of Meander, and the legendary thinker Socrates is rumoured to have dreamt that a swan flew into his waiting arms on the night that he took on a student who would become a legend in his own right, Plato. An extension of this tradition is the view that swans are the messengers of the Faeries. Swans have divine connections. The Celtic goddess, Brigid, known for her beauty and eloquence, was often depicted with a swan nearby. The Swan Song highlights the Greek god, Apollo, and his association with these elegant birds. As a sacred bird of Apollo, the Mute Swan is rumoured to only sing its memorable, enchanting song to people who have earned the right to hear it. According to the legend, the Swan Song is the most beautiful song that a mortal being could ever hear and is only sung on the person's deathbed. The Swan's connection with Purity and Chastity may have been born from Norse folklore. According to the legend, two swans drank from the sacred Well of Urd, known to contain the "purest of the pure" water. The water had the ability to transform anyone or anything that drank it white, making them pure and chaste, thus cleansing them of sin. As such, all the descendants of these magical creatures were automatically cleansed of sin. This concept is also seen in Hinduism. Swans are representative of holy men, people who are able to live in the world and not become corrupted by it. The Swan is the symbol of the Hindu goddess of Knowledge, Music, and Purity, Saraswati. Even many religious figures in Christianity are associated with these pious birds. Swans are also emblems of Loyalty, Love, and Family. These animals are renowned for being life-long mates and pairs rarely separate once they have formed a solid bond. There are numerous stories of swans taking a liking to objects and people, and never leaving their side, no matter what. St. Hugh of Lincoln can attest to this fact, as well as a tattered swan shaped boat that now rests on a lake in Muenster, Germany. Both have the dubious honor of being the apples of a swan's eye. Swans are doting parents, springing to the defence of their offspring at a moment's notice. All across the globe, the Swan is much more than just a waterfowl; it is a symbol of inner strength, exquisite beauty, and purity. Do you see yourself as a delicate swan? Swan Tattoos are a favorite among women because of the animal's close association with Elegance, Beauty, and Femininity. A swan is a picture of feminine perfection and having such a tattoo shows that you embody all the traits of the perfect woman. As such, most Swan Tattoos are fluid and delicate, playing up the perceived soft and gentle nature of women. 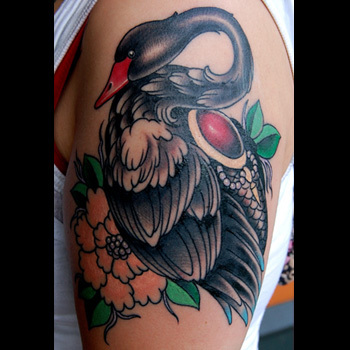 You'll find that the most colorful parts of a Swan Tattoo usually are the background elements and not the swan itself. The tattoos may be occasionally colorful, but most times, artists stick to traditionally light colors to reinforce the concept of purity. The Black Swan is considered to be the rarest of the rare, making them an emblem of both reverence and fear. A Black Swan is a revered totem in certain Aboriginal tribes in Western Australia. In the European context, the opposite holds true. A Black Swan is seen as a sign of innocence and purity lost. Russian composer, Tchaikovsky, plays with this concept in his classic ballet, Swan Lake. Black Swan Tattoos represent Rarity and exotic beauty, as well as symbolize your desire to go against the status quo. Tribal Swan Tattoos tend to border on the realm of Black Swan Tattoos, but there is still some distinction between the two. Tribal Swan Tattoos draw on the spiritual association between the Swan and many elements of the Divine and is, in a sense, a nod to the deeper, more complex spiritual side of your persona. Black Swan Tattoos, on the other hand, have elements of rebellion associated with the design. In no other culture does the Swan play a more pivotal role than it does in the Celtic and Irish traditions. In fact, it can be said that the two (the Swan and the Irish) go hand in hand. Countless Irish and Celtic lore bring to light the importance of these magnificent birds, linking them with elements of Nature and giving them Divine connections. From ancient, Celtic goddesses to mythical fairies, the impact of the Swan in Ireland is far-reaching. Celtic Swan Tattoos not only link you with the spiritual aspects associated with this bird, they also connect you with the ancient culture of Eire. An exotic beauty should always have a Swan Tattoo to channel the sensual and delicate nature of your persona. Swan Tattoos can have a variety of elements, but most designs focus on the beauty of the animal and the message that its image sends. Creating a unique design can be a daunting task, but luckily our team of artists is more than happy to lend a helping hand. Simply visit our design page at www.itattoodesigns.com and take advantage of our Custom Design Service.